New York City is the city that never sleeps... and my husband added "and babies too" hahah. I don't know if it's a joke or what. It's a busy city and I was not suprise when I saw road signs like this (photo above) on their busy street. 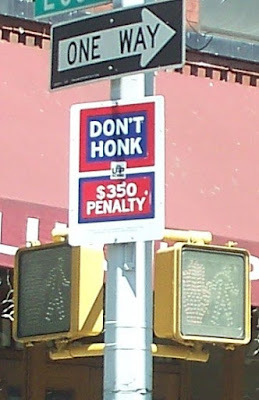 Well, folks in our five days of staying in New York City during our trip/vacay last month I heard lots of honking everywhere. really? naa penalty? waaaaa...kuyaw pod...ehhehehe!